Two types of chargers are made by Levin. 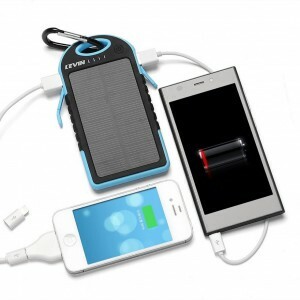 The first type is an all-in-one solar charger and portable battery. You can charge it from your computer or charge it from the sun, and then you can use it to charge your phone, tablet, or other USB-powered device. The second type of device is just a solar panel – but it’s much larger, so it can collect much more solar energy for you. Levin currently offers two models of solar batteries – solar panels directly connected to a USB portable battery. Both are physically similar, with the main difference being the capacity of the battery: one battery stores 5,000 milli-amp hours (mAh) of power and the other stores 12,000 mAh. The 5,000 mAh battery features a 1.2-watt solar panel and is 5.6 inches tall by 3.0 inches wide by 0.5 inches thick. It weighs 5.3 ounces – slightly more than a 4.0-ounce iPhone 5S. The 12,000-mAh battery has a 1.7-watt solar panel and is slightly larger: 6.6 inches tall by 3.5 inches wide by 0.7 inches thick and weighing 10.9 ounces – about as much as an 11.7-ounce iPad Mini. Both solar batteries are rain-proof (when the charge ports are sealed with the included covers) and provide up to 2.1 amps of charging power to two USB ports, so you can charge two devices at the same time. They also both include a built-in LED flashlight and a micro-USB input that allows you to charge the device from a separate source of power. In practice, these chargers will only provide between 1,000 and 2,000 mAh a day. Compare that to the iPhone 5S which has a 2,440-mAh battery. 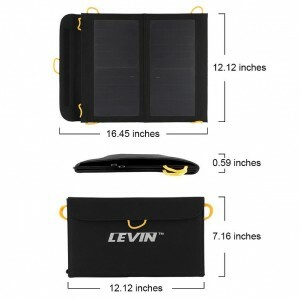 If you use your phone lightly so that its battery lasts about three days, the Levin solar chargers should be just fine. If you have to fully charge your iPhone every day, these chargers probably won’t provide enough power on their own – however, if you pre-charge the batteries using the provided micro-USB port, you’ll probably have enough power to get through a weekend camping trip. The solar part of these chargers is mainly for emergencies or for using devices which don’t require much charge, such as MP3 players or phones that are only turned on for a brief time each day. Users who take them camping usually pre-charge them to full using the micro-USB port. 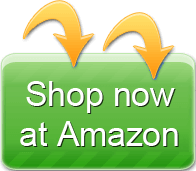 (You will need your own micro-USB cable, however these are quite common so most people already have a spare cable.) Once charged, you can pack away the device for up to several months without it fully emptying. On the first night of the camping trip, up to two devices can be recharged overnight from the battery. 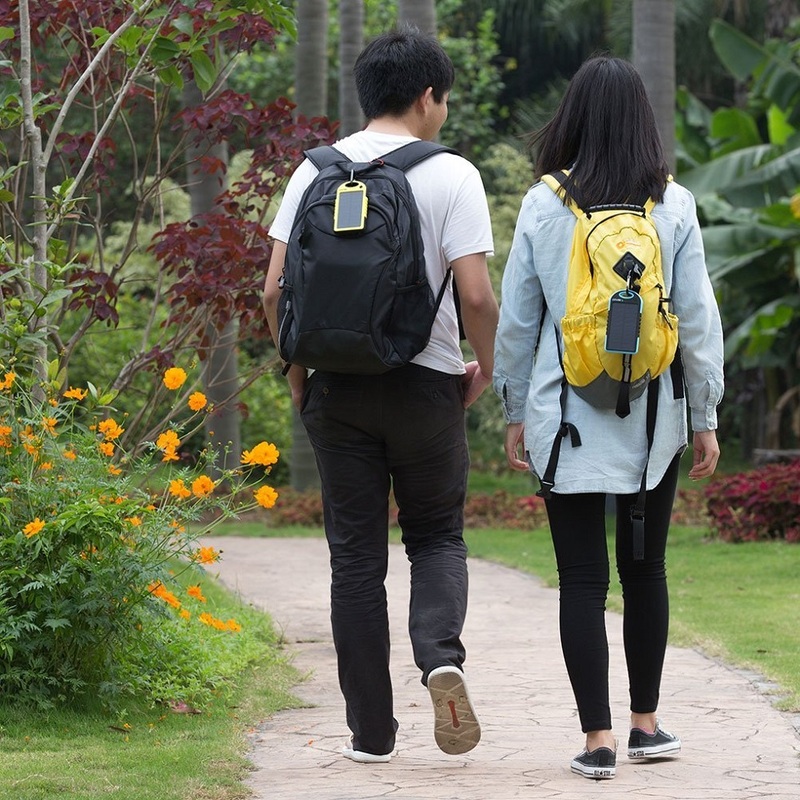 The next day, the battery can be left out in the sun – preferably at the campsite, but possibly attached to the back of a backpack where it will get a little bit of sun. That night, the solar charger can be connected again to the devices – it probably won’t fully charge them, but you’ll get something. For emergencies when you’re without power at home for several days, these devices can provide about 1/2 charge for modern smartphones each day, allowing you to use your phone to send text messages to friends and family for an hour or two, after which you shut down your phone to conserve power. The batteries can only be charged at 1.5 amps (1,500 milli-amps) max, so it will take a bit over three hours to fully charge the 5,000-mAh solar charger and five hours to fully charge the 12,000-mAh charger. If you use a charger or a cord which only supports traditional 1.0-amp charging speeds, that becomes five and twelve hours, respectively. Using this charger is functionally identical to using a portable battery with a solar panel – except that you can’t remove the battery. 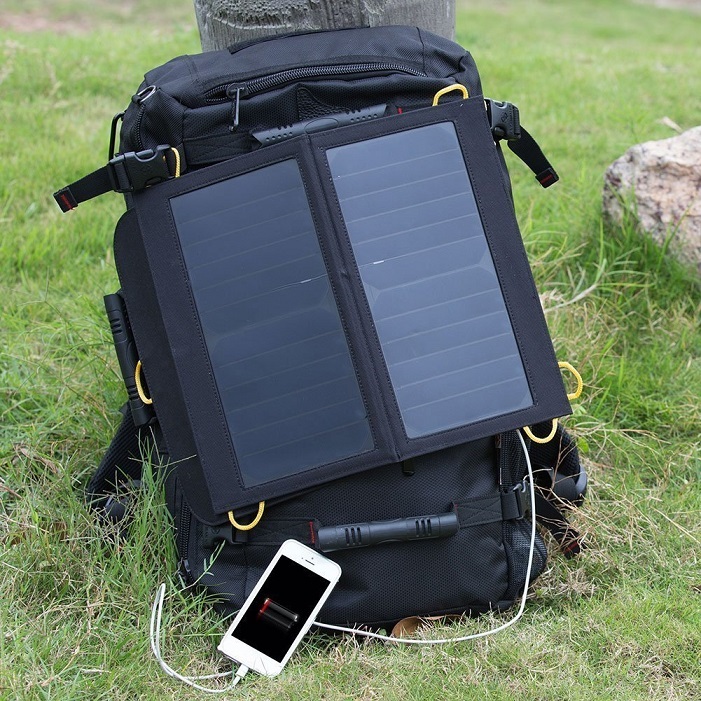 This makes it a little bit more portable but also means that you have all the downsides of a portable battery to go with your solar panel. For example, the solar panel can tolerate more heat than the battery, and the solar panel will almost certainly outlast the battery – panels are good for up to 20 years but lithium-ion batteries only last about 5 years. Provides up to 2 amps of charging power, so it can charge recent devices such as the iPad 3 and iPhone 6 at full speed. It also has two charge outputs, so it can charge two devices each at 1 amp. It will take longer to charge devices this way, but it will allow you to ensure that they get charged evenly. You need to provide your own charging cables. When closed, the solar charger is 12.1 inches tall by 7.1 inches wide by 0.6 inches thick – about the size of a single-subject paper notebook for school. 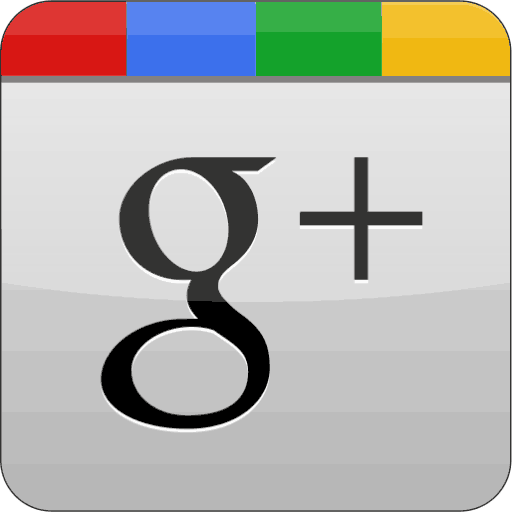 When open, it is 16.5 inches tall by 12.1 inches wide by 0.3 inches thick. It weighs 15.0 ounces – just under one pound. Compared to the similar 14-watt solar charger from Anker, it’s slightly larger when closed, half as large when open, and weighs almost exactly half as much. The panels claim to be 22% efficient, compared to the 18% efficiency available in most solar panels (including the comparable Anker panels). They’re covered in a strong but lightweight plastic to prevent damage and are held together using a plastic canvas. There are seven fabric loops provided which help you attach the panels to a backpack, bicycle, tent, or other object. This is one of the most powerful two-panel solar charger solutions available, although having only two panels does mean that it really does require bright sunlight to work well. Although attaching this to your backpack will gather some energy, it’s unlikely to provide much charging power. My Apple device says, “not compatible with this device” and then stops charging. Apple devices in particular – although some Android devices do this also – display a warning when the charge rate gets too low. This shouldn’t happen when charging from a laptop or a wall socket, but with the solar charger it can happen every time a cloud passes over head. Unfortunately, in some cases, devices won’t start charging again until you either clear the error or disconnect and reconnect the charger. If your device does this, you almost certainly want to buy a simple USB portable battery so you can use the solar charger to charge the portable battery and then use the portable battery to charge your device. The fabric loops broke when I tried to use them. There are a large number of reports of problems with the fabric loops. They seem to be of inferior build quality, and even the ones that don’t break immediately may wear down quickly with age. Levin has been responsive to problems, so if one of your loops breaks, be sure to contact them. The only alternative is to sew on your own loops – which is not a difficult procedure. I don’t get the advertised efficiency of 2.1 amps. With only two panels, you really need a bright and sunny day to get the fully efficiency on this solar panel. On the other hand, if you don’t have this device aimed at the sun at a 45-degree angle, you’ll never get full efficiency. Having to aim the panels at the sun is a problem with all solar panels, but a solar charger with four panels (like the one available from Anker) will likely be more efficient on a less-sunny day. As explained previously, this charger is nowhere near as effective as it can be when you attach it to a backpack or other object which isn’t correctly aimed at the sun all day. That means you either need to attach your device to the charger all day – fine for devices you only plan to use at night – or you need to buy a portable external USB battery. A reasonable option is the 12,000-mAh solar battery reviewed above, although since you already have a solar charger, you may want a more affordable battery from Anker, EasyAcc, or another manufacturer. There’s a huge difference between just putting your battery in the sun and correctly positioning it to absorb the most sunlight. The guide which comes with this panel simply says, “position at 45-degree angle to the sun.” To figure out exactly where that is and also compare multiple locations at your campsite, consider purchasing a USB power meter which will show you exactly how many amps your charger is generating in real time. You will also probably want to keep your non-solar devices out of the bright and hot sun, as bright lights and heat can damage many modern devices (including portable batteries). For this you don’t need anything special – you may already have a USB extension cable, and if you don’t, they’re quite affordable. A little extra cable will help you put your device in the shade while the panels are absorbing sunlight. Unfortunately, there’s no standard for comparing USB solar chargers, so companies can make advertising claims based on different facts. For example, the four-panel 14-watt Anker solar charger has nearly-identical advertised performance compared to this Levin charger even though the Anker charger is almost twice as large and twice as heavy. The difference is the amount of sunlight required to generate the advertised wattage – the Anker charger will work better in lower-light conditions than the Levin charger. If you’re hiking in a bright desert, the Levin charger is perfect. If you’re in a more cloudy area, you may want the Anker charger. Yes and no. The 7-watt and 13-watt solar chargers are fixed at a 5-volt output, which is the amount required for USB devices but not enough to charge laptops (which typically start at 9 volts for tiny netbooks and go up from there). 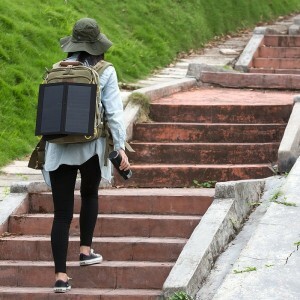 The 20-watt solar charger can charge many laptops, although laptops tend to have very high capacity batteries, so it takes a while for the solar charger to full charge the laptop battery. Yes, with some loss of efficiency depending on the window material. Many high-end windows today include Ultra-Violet (UV) radiation treatment which helps protect your eyes and skin from damaging solar rays. Unfortunately, the solar charger can use some of these rays to generate power, so your device won’t perform at its peak. You should also be careful of high temperatures. The transparent plastic on the solar panel is only designed to get up to about 120 degrees Fahrenheit before it starts deforming – but a car dashboard or other unventilated location can easily get hotter than that. The combination charger/batteries are a great option for anyone looking for just enough power for a weekend camping trip, and the 13-watt solar panels are similarly great for anyone looking to keep their devices charged for a week-long or longer trip. I have a question. 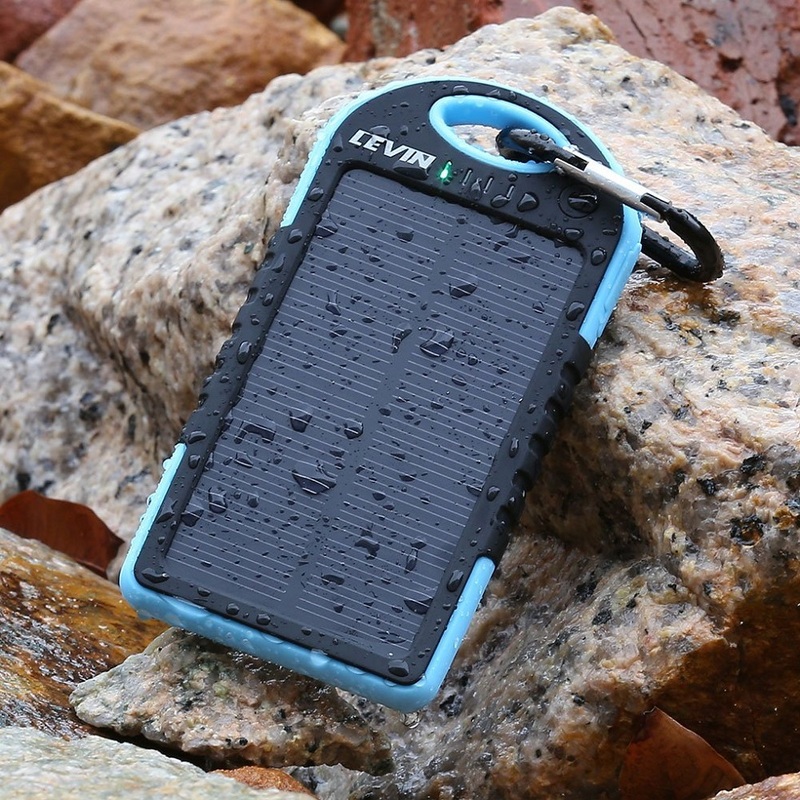 It’s only been a few months since i started using my levin solar powerbank but now it won’t charge anything. The LED flashlight still works but when i press the power button once all 4 lights(infront) just flash. I don’t know how to fix it. Just to be clear, this product works really well! Keep the charge inside for months, I had it attached on my bacpack exterior and I keep it in the darkest area of my appartment. Just checked it up now becouse curious and it has 3 aout of 4 LED lights on. I’m charging my phone right now and the charging speed is the same as I had it plugged on my computer! Seen a lot of negative feedback, maybe I just got the lucky one, too bad for the others! !